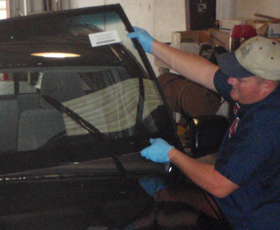 There are a number of factors to consider when seeking windshield repair experts in Houston. You may not realize this, but it’s important to choose a company that meets a number of criteria in order to ensure that your work is top-notch once completed. Remember, we are talking about your windshield. It is a vital component of your vehicle. Without successful installation, you can run into a number of problems that you’d much rather avoid. With that in mind, let’s take a look at the main factors to consider when choosing windshield repair specialist. Consider this: you are driving along and everything seems to be going okay. Then suddenly out of nowhere a pebble kicks up from the car in front of you and it hits your windshield. Upon impact, the glass immediately shatters and starts to crack. Do you bring your vehicle to the Houston windshield repair experts at Apple Glass Company, or do you shop around for the cheapest price? We hope that you take the time to find a company with experience. This all but ensures that the installation or repair process goes as smoothly as possible. By choosing a company with experience, you are putting yourself in a position to receive the best available service. This is smart on your part, because a repaired windshield is necessary for safe driving. Unfortunately, we never know when a situation will arise. We never know if a repair person will accidentally make a mistake. If this happens to you, it’s in your best interest to have a guarantee. This way you will not have to pay for the same windshield repair work to be completed again. The guarantee will cover you in the event that something regrettable happens beyond your control. Let’s face it. When it comes to repairing your windshield, you should only want the best. That means choosing a company with cutting-edge repair and replacement processes and procedures. Choosing a company that has the top-of-the-line equipment almost guarantees that your repairs are completed without any further issues. Choosing a company with the best windshield repair and replacement company in Houston makes the most sense. It’s simple to choose windshield repair specialists according to best price. But are you choosing the best glass company that can get the job done right the first time? That’s the question to ask yourself before making your final decision. Contact the specialist at Apple Glass Company for more details on what to look out for when selecting a Windshield Repair or Replacement expert in Houston. This entry was posted in Windshield Replacement And Repair. Bookmark the permalink.